NOTE: The reporters for "War in Europe" interviewed Serb soldiers, KLA fighters, and Albanian survivors. All spoke on the condition that they remain anonymous. Names, dates and details of specific events that could be used to identify them have been edited from these transcripts. Three Kosovar Albanian survivors relate what happened during the massacre at Precaz on February 26, 1998 and at Racak on January 15, 1999. As commander of the Yugoslav 3rd Army, Gen. Nebojsa Pavkovic held overall responsibility for the prosecution of the war in Kosovo. Since the Serbian withdrawal, Pavkovic has claimed that NATO did only minimal damage to Yugoslav troops and has repeatedly threatened to renew fighting in Kosovo. A Milosevic loyalist, he is now the Yugoslav army chief of staff. Hashim Thaci is a former Kosovar Albanian student leader who helped to found the underground movement that became the KLA. Nicknamed "Snake," he returned from Switzerland in 1998 to fight against the Serbs. At the Rambouillet peace conference, the 30-year-old Thaci garnered international attention as the KLA representative who stubbornly refused to compromise the rebel group's agenda. Since the war, Thaci has served as the prime minister of the KLA's self-styled provisional government. Volunteer and conscripted Serb soldiers describe their participation in the persecution of Kosovar Albanians. Three KLA fighters speak about why they took up arms against Serbian forces. This is the official report the human rights findings of the OSCE Kosovo Verification Mission, led by Ambassador Bill Walker between October 1998 to June 1999. The extensive report details "a pattern of human rights and humanitarian law violations on a staggering scale, often committed with extreme and appalling violence." It includes a municipality-by-municipality accounting of atrocities and a picture gallery. The Kosova Information Center hosts a number of very graphic photographs of atrocities from the massacre at Racak, January 15, 1999, when Serb security forces killed 45 Kosovo Albanians in retaliation for a KLA attack on four Serb policemen. The investigation into the number of Kosovar Albanians killed by Serbian forces has not been completed, but has given rise to a controversial debate. Opponents to NATO's intervention in Kosovo have claimed that the number of casualties was exaggerated in order to justify the bombing of Serbia. 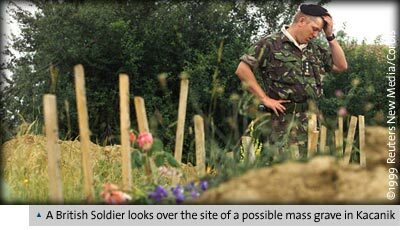 In October, 1999, the Texas-based analytical group Stratfor issued a report called Where are Kosovo's Killing Fields? which claimed that casualty figures were manipulated to serve political ends. Their argument was based on early results of the International Criminal Tribunal investigation which turned up fewer bodies than initially predicted. Ian Williams, UN correspondent for The Nation magazine, responds to Stratfor's allegations of exaggerated numbers and examines the difficulty in determining an exact figure in his article, The Kosovo Numbers Game, in the Balkans Reports of the Institute for War and Peace Reporting. A related issue is the number of civilians killed by NATO bombs. According to Human Rights Watch, the Pentagon has suggested that only twenty to thirty incidents resulted in civilian deaths during Operation Allied Force, while the Yugoslav government has claimed that NATO was responsible for between 1,200 and 5,000 civilian deaths. However, a Human Rights Watch report issued in February 2000, Civilian Deaths in the NATO Air Campaign, concludes that at least 500 Yugoslav civilians died in ninety separate incidents during the 78 day bombing campaign. The report also finds that NATO committed violations of international humanitarian law in its targeting and bombing practices. The OSCE report Kosovo/Kosova As Seen, As Told includes a section on the structure, weaponry, and activities of the military/security units involved in both sides of the war in Kosovo.